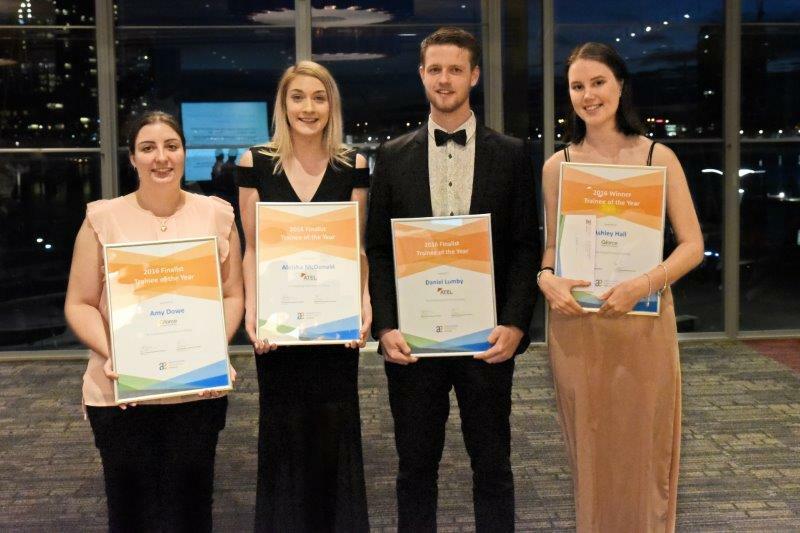 Local Geelong trainee Ashley Hall, awarded the 2016 Apprenticeship Employment Network Trainee of the Year Award at the AEN Annual Industry Awards Dinner Thursday 17 November at Waterfront Venues, Docklands. Apprenticeship Employment Network (AEN) is Victoria’s largest apprentice and trainee employer network with their members securing employment for 150,000 apprentices and trainees over the last 30 years. Their awards ceremony is held annually to acknowledge the outstanding achievements of our members, staff, apprentices and trainees within the Victorian GTO industry. The 2016 AEN Trainee of the Year title is awarded to a trainee that has displayed and demonstrated excellence in their study, training and work, as well as contributing to the local community. Hall received the title for completing school based traineeship in Certificate III Community Services Work whilst undertaking secondary study in 2015 as hosted by G-Force Employment Solutions. Throughout and beyond her studies, Hall has displayed a genuine interest in the health care industry, excelling in all aspects of her job, and delivering a little extra to the role-compassion. She commenced her placement with Diversitat in their multicultural aged care facility where she showed the elderly compassion, gentleness and respect despite the language barrier. Halls work made a positive impact on the day to day lives of her clients. Hall shows this level of compassion and understanding in every aspect of her life. During her traineeship, Hall completed the Kokoda Track as part of the Kokoda Youth Geelong. On her return home she actively campaigned and raised money for one of the porters whose home was lost. Further, Hall recently won a Rotary Award for 2016 Trainee of the Year and she is an ambassador for the community services industry. Hall was up against three other outstanding trainees for the title including Amy Dowe (G-Force Employment Solutions), Daniel Lumby (ATEL), and Aleisha McDonald (ATEL). Further information on these nominees can be found in the companion document below. Apprenticeship Employment Network is proud to award such a moral citizen like Hall with Trainee of the Year and look forward to seeing Ashley Hall achieve more great results in her career going forward. Congratulations Ashley! Acquired the knowledge and skill in a short period of time and is responsible for organising bookings & and deliveries to various businesses. Excellent communication skills, pays attention to details, hard working & quickly adapts to a changing environment. Daniel is a local Wodonga resident and from a young age has displayed a maturity beyond his years. Demonstrated leadership skills and has a variety of interests from sport to drama, his willingness to participate in a variety of activities has led him to many achievements. Daniel was selected to complete a Certificate III in Information, Digital & Technology. As a result of Daniel’s exceptional work ethic, he has been accepted to RMIT University (Melbourne) to undertake a Bachelor of Business in Information and Systems. Aleisha is a committed, determined individual who strives to succeed. Awarded Student of the Year.